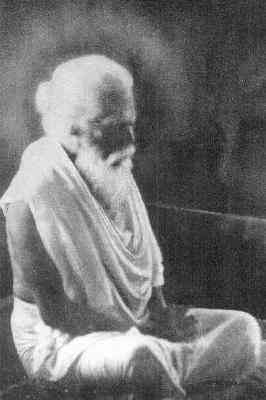 The 123rd birth anniversary of Yoga Swami fell on 21st May 1995. The following article was written by Santhaswami who was the elder son of the late Lord Soulbury, former Governor-General of Sri Lanka. On the death of his father, he inherited his viscountcy and became a member of the House of Lords. He had sought Yoga Swami's permission to renounce his viscountcy in favour of his younger brother, but Swami refused. Instead, he initiated him and gave him the name Santhaswami. The fundamental aim of all religions is the realization of Truth. This is a matter of direct experience in which neither the mind nor the intellect nor any human faculty is involved. It is a question of being. There is only one reality, which is God or 'That' (tat) so that realization of truth means being aware that you are one with God or that you are "that' (Tat tvam asi). This is the meaning of 'know thyself'. He who knows himself knows everything and is one who has attained liberation while in the human body (jivanmukta). There is nothing left for him to do but to help others to come to the same realization. Such a person is the true master (sat-guru). Those who have attained this state are exceedingly rare. But one such 'realized soul' lived in the North of Sri Lanka for over ninety years and left his body only in March 1964. He was known as Yoga Swami and took birth a hundred and twenty-one years ago. He received his early education in a Christian missionary school and, either tan or later, acquired a good knowledge of English. After leaving school, he was employed for some years as a storekeeper in the Irrigation Department at a place about forty miles south of Jaffna. During this time, in his early manhood, he met his guru -- Chellappa Swami. Soon afterwards he gave up his job -- and everything else -- in order to follow him. Chellappa Swami was usually to be found in the neighborhood of Nallur, now a suburb of Jaffna town, but once the capital of the Tamil kings of the place. The is situated the most important temple in Jaffna, dedicated to Kandaswami or Murugan. Close to the temple itself is a large building used to house the massive wooden chariot in which the image of Murugan is drawn round the temple on the occasion of the yearly festival. This was Chellappa Swami's favourite haunt and the place where the imparted most of his teaching to his disciples. He did not do anything but wandered about as he pleased, clothed in rags and begging for food for his sustenance. Most people thought that he was mad, for he would often throw stones at those who tried to approach him and abuse them in language. Only very few had the purity of mind and heart and understanding to perceive his true greatness and to detect the unlimited wealth that he had in his power to bestow. Yoga Swami was one of the lucky few. Even he was chastened and driven out many a time, but Yoga Swami withstood all these because of his thirst for realizing the Truth. It would appear that Yoga Swami was with his guru only for a few years. At a certain point of time he was driven out and told to "Stand on your own legs!". There is also a story that when he came to visit Chellappa Swami in the final stages of his last illness, the latter would not allow him to enter the hut in which he was lying, but shouted from within, "Stand outside and see!" During the eyars immediately before and after Chellappa Swami's Mahāsamādhi, Yoga Swami was living under a tree at Columbuthurai on the outskirts of Jaffna town. At this time he appears to have been practising severe austerities and in his outward behaviour to have followed the example of his master, for he would drive away those who tried to approach him. But gradually, as more and more devotees gathered round him, his austere demeanour seems to have been relaxed, and he was eventually persuaded to occupy a small hut in the garden of a house near the tree under which he had been living. This remained his 'base' for the rest of his life. There devotees would come to him for help in all their problems, usually in the early mornings and in the evenings. Since the majority of his followers were Hindus, his teaching was expressed mainly in Hindu terms, but he himself was beyond all distinctions of religion. Buddhists, Christians, Muslims and agnostics would all come to him for help and guidance, for he had reached the summit to which philosophies and religions are merely paths. Like a good doctor he knew what was best for each of his 'patients' and altered his 'prescriptions' accordingly. His teaching embraced all the yogas and at the same time lay beyond all of them. Nearly all his devotees were householders and engaged in some employment or other, and apart from one or two exceptions, he rarely advised them to retire from their employment. People would often come and say that they wanted to give up their jobs in order to be able to devote more time to spiritual practices but he did not usually encourage them to do this, since, for him, the whole of man's life had to be made a spiritual practice and he would not admit any division of human activity into holy and unholy. To most of those who came to see him, he would end by saying "Now go and do your work!" He laid great emphasis on work and work for work's sake -- that is, Karma Yoga. This like Siva dhyana (meditation on God or what is Real), was one of the 'medicines' that in one form or another, he most frequently administered. He gave no lectures and held no classes. His teaching was given spontaneously as it came either at his hut in the mornings or evenings or at some apparently chance encounters in the bazaar or in the streets or maybe, if a devotee was sufficiently fortunate, at a surprise visit to his own house. Most of what he said was usually intended for one particular individual though others present would of course also profit from it. He untiringly tried to raise his followers to the understanding that Truth lies beyond all forms. Throughout his life he also did his best in many different ways to encourage and revive the proper observance of traditional practices and every evening at dusk, a lamp, symbolizing he sacred fire, would be lit in his hut and certain devotional hymns sung in his presence. As his followers became more and more numerous, he gave them work to do and encouraged them to translate into Tamil a few writings in Sanskrit or English that he considered to be important. 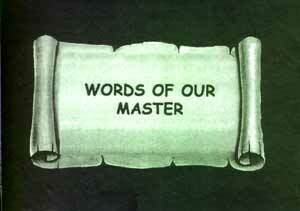 In 1953 he made them start a monthly paper devoted exclusively to religious subjects. In every issue would appear one of his songs. These songs, to which he gave the name of Natchyintanai -- that is, 'Good Thoughts' -- flowed from him spontaneously and might come forth at any moment. 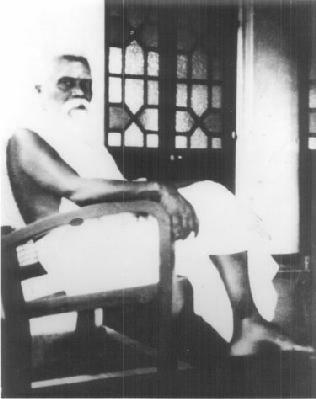 In 1935 he sanctioned, at the desire of some of his followers, the establishment of a place in Jaffna town where they could meet and this developed into a centre where they were able to practise meditation, sing devotional songs, hold classes in religion and philosophy and generally carry on any activities useful for spiritual growth. The name which he gave to the paper, to the institution and to the organization which controlled it was Sivathondan. Siva is God and Thondan has the meaning of servant and also that of devotee, so that the word Sivathondan signifies a devoted servant of God or one whose service is devoted to God, that is, one who does everything that he has to do for God and not for himself. Everything is God's work and in one sense everyone, every being, is doing Sivathondan. But man has won the unique privilege of being able to do it consciously. To make use of this rare opportunity is the best and easiest way open to him in this age of purifying himself, subjugating his ego and attaining therely that unalloyed happiness which is his birthright.